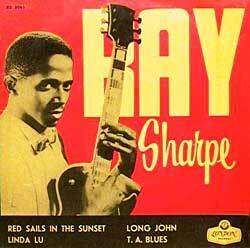 Legend has it that black rockabilly performer Ray Sharpe once had plans to form a duo with his friend, white rockabilly performer and fellow Texan Ronnie Dawson. They were going to call themselves the Oreo Cookies. The more you listen to Sharpe, the more you wish it would have happened (Reportedly, the idea was scrapped when the two young rockers realized that the rest of the world might not see the humor in it that they did...), reason being that it's amazing how much these two guys influenced each other's styles. Though he's known for the classic roadhouse staple "Linda Lu," the Fort Worth native's swan song is a chicken walkin' opus entitled "Monkey's Uncle" which Dawson himself recorded on a recent album, after years of leveling the house with it during his stage show. Produced by the always fascinating Lee Hazlewood, it's no wonder that the damn thing sounded so cool when Sharpe first cut it in '59. Mixing with like-minded rockers Al Casey and Duane Eddy, Sharpe defined that twangy-heavy thread of rock 'n' roll that Hazlewood helped to mastermind, usually best summed up by the recorded works of Jody Reynolds and Sanford Clark. His songs have been recorded by acts ranging from Neil Young and Rickie Van Shelton to swamp guitarist Danny James and bottleneck master J.B. Hutto, while his entire approach was a huge influence on Southwest rocker Bobby Fuller. Truly an enigma, the great Texan seems to simultaneously embrace all the ingredients of rock 'n' roll's magic potion with similar aplomb, a rare feat since day one, but one that makes him a living example of the real thing. Right on, Ray! !